top mlm companies – 💗 CTFO, Inc. Viral network growth. That is the dream of every serious home business builder. Viral growth means that your team is growing by more new people than you can bring in on your own. This has happened for me in CTFO, so I know it can happen for you as well. My very first CTFO referral joined on November 1, 2015. As of this writing, April 12, 2016, I have personally referred 414 people. My network has grown to 2035 team members total. My referrals, and their referrals, etc., have brought in 1611 additional team members in that same time frame. Need a breakthrough in the growth of your customer network? Then refer people fast! First, have you made the commitment to create this in your home business? It is imperative that you commit to doing this, and that you are determined to stay on track referring people into your CTFO home business. You are the Team Leader. You set the pace of growth. Only you. No one else. You. Somehow, by osmosis, your personal commitment, or lack thereof, will be reflected by your team. Don’t ask me how, why, or why some people join and do nothing, yet continue to be bitter about their circumstances. That is just human nature. If you refer a handful of people and quit, your referrals will quit too. Stay focused on referring, detached from judgement or any emotional expectation of what your referrals do. Refer, reach out and share your excitement, keep referring. By being an example of commitment and determination, you open a path for the leaders from your personal referrals, to rise up and follow suit. Visualize this… Put the front bumper of a car up against a brick wall, and accelerate it slowly. Eventually, because of the slow acceleration, the wheels will begin to spin in place and the wall won’t budge. Take that same car and accelerating it to a mere 30 miles per hour, will break right through that wall because of the car’s momentum. Same car, same weight, different approach. A fast one! It is the same with viral customer network growth in your CTFO CBD biz. Refer as fast as you can. Aim for at least one free member per day, everyday. I personally set a goal of five, and the actual average is three. My best day is 16 personal referrals! Assess your skillset, then take action! Analyze your strengths. Take a good look at what tools are available to you, and what you can work with. If you are good with computers and problem-solving, then Internet Marketing might be a good place to explore. If computers seem daunting to you, then look at the CTFO Online Visitors Program. If you can afford the printing and postage, look at putting the postcard program into play, or think of ways you can hand them out to people face to face. If you have weight to lose, and want to do it while building your biz, use CTFO weight loss products, and let people come to you and share the products you are using with them. Put several of these methods in action. The key here is not to give up or come to the conclusion that you cannot do it. There is always a way to build your customer network. Decide, commit, and get started today! 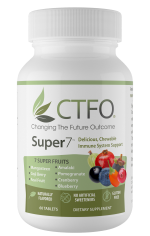 Creating viral growth in your home-based business is actually very simple, especially in the case of CTFO, since CTFO has absolutely no cost barrier for participation. It will never get too expensive to keep your business open, since it is completely free to build a customer base. What it will come down to is… How badly do you really want to succeed? How deep is your resolve to make it finally happen? Have you made the commitment to yourself, honestly, to see your goals through to their fruition? Can you visualize your team growing virally, and more importantly, as you visualize it, does it excite you, charge, you, and does it inspire you to take action most days of the week, toward your personal referring goals? Your resolve affects the etheric universe. Without getting too metaphysical, as that is a whole different topic, the intention you put forth by your thoughts reorganizes the universe and attracts that thought reality into your physical experience. In short, just look at your life today, and think of the most dominant thoughts you’ve had about who you are over the past five years. Really analyze them. Those thoughts seeped into your subconscious, your brain put it out there concluding that is who you are, and then it brought that into your current experience. You are you, because of the way you’ve been thinking you are, and those thoughts have been the blueprint of your current experience. Whether you like it or not, the good things in your life, as well as what you perceive as “bad” are a manifestation of your subconscious thoughts. It is time now, as pertaining to your home business, that you begin to consciously reorganize your thought pattern to bring forth the experience of viral growth in your network, and when your customer network grows, income will follow suit. I can hear you you telling yourself now… “but, I’ve tried” or “it hasn’t worked for me.” Those are your blocks. It is the current you fighting change because it doesn’t want to die. The broke you is alive. It has a heartbeat. It feels. It will fight to keep you broke and filled with excuses. The fat, unhealthy you, is alive. It has a heartbeat. It feels and will send you cravings and bad habits, to stay alive. The only thing that can change these circumstances is your commitment level to becoming something different. The you that you want to be, healthy, financially free, strong, successful, etc., begins in your mind. See and visualize what you want. Ponder it at all times. The moment an excuse pops up, a negative thought, kill it with an affirmation of who you want to be. Interrupt it by telling yourself “I am this…” the moment you think it. I am a millionaire networker. This affected many things in my life once it was ingrained into my subconscious. I’d catch myself while driving, or working out, saying those words to myself effortlessly. During sleep, I’d hear and see those words. Dreaming of being on stage with hundreds of people present and a deep, gratifying feeling of gratitude, and graciousness for my success with tears running down my face, as applause from the audience filled my heart with joy. That is my customer network. I’ve had this dream many times. It didn’t matter that the company I was promoting at the time went bust. It’s didn’t matter that the path to that vision was unclear for a while there. I knew it was coming. I knew the “how” will show up because in my mind, this is who I am. I am a millionaire networker. Circumstances started to shift and change to clear the path for the how, even in ways that others might judge as “bad,” I know in reality, it is what is necessary for me to become more, and thus be able to give more to others around me. When I become a millionaire networker, everyone within arms reach will prosper as well! In comes the Chew The Fat Off Opportunity. By holding the thought, ingraining the thought into my subconscious, “I am a millionaire networker” the universe brought CTFO into my life. 3Steppers didn’t exist as it is today. It was an undeveloped registered domain. The first step for me was to refer 100 people as fast as I can possibly do it, and teach others how to do the same. The industry average is 2.7 referrals into a paid opportunity, so I knew that not everyone can do much better than that, however, anyone can refer free members since there is no cost barrier. My numbers show that 100 free members, 8% will place an order voluntarily in time. 8% order rate dos not mean, refer 10 then quit because none ordered. Refer 20 then quit because not one ordered. The key is to commit to referring 100 people as fast as possible, connecting with them and sharing your intention, your excitement about the biz, and asking them to do what you are doing only. If you are referring 100 before placing an order, share with them that is what you are doing. I referred 47 people before my first sale. Because this was done at an average of 20 per week, I was setting the pace for momentum to happen. The beauty of this is that it was not the 47th person that joined who made a purchase, it was the 16th person who joined two weeks prior. By my 3rd month, over 8% of the first 100 referrals placed an order. See why you can’t stop referring after a dozen or two, and give up??? Do you want your referrals to quit after referring a handful, or do you want them to persist and commit for the long run? Make the commitment. Login to 3Steppers, watch the network marketing videos in the members area to fuel your brain with the new thinking, examples, and ideas that will allow you to commit at a deep subconscious level. Interrupt self-defeating negative thoughts. Bask in visualizing who you truly are, attach pleasant feelings of gratitude, and imagine how your days will be different once you are a millionaire networker! YOU are the team leader, YOU set the pace!